The Attritor features a frame to accommodates two tanks constructed of stainless steel. Union Process Inc, which specialises in particle size reduction and dispersing equipment has built a new grinder for its in-house pilot plant. The Attritor features a frame to accommodates two tanks constructed of stainless steel. The mill has an explosion-proof motor and uses a remotely mounted variable frequency (inverter) drive. On the Attritor, there are stop/start push buttons with a potentiometer for controlling the speed. This story is reprinted from material from Union Process, with editorial changes made by Materials Today. The views expressed in this article do not necessarily represent those of Elsevier. Union Process has developed a pilot-sized mill for cryogenic grinding with a stainless steel insulated cryogenic milling chamber. Union Process, a manufacturer of particle size reduction and dispersing equipment, has manufactured a grinding mill for battery technology. 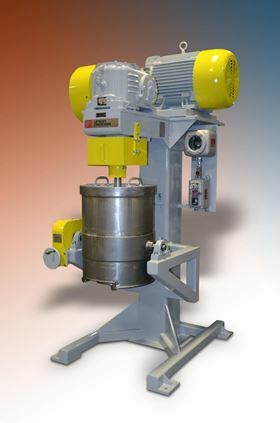 Particle and grinding specialist Union Process, Inc has built a new SD-100 dry grinding Attritor for its toll milling operation.